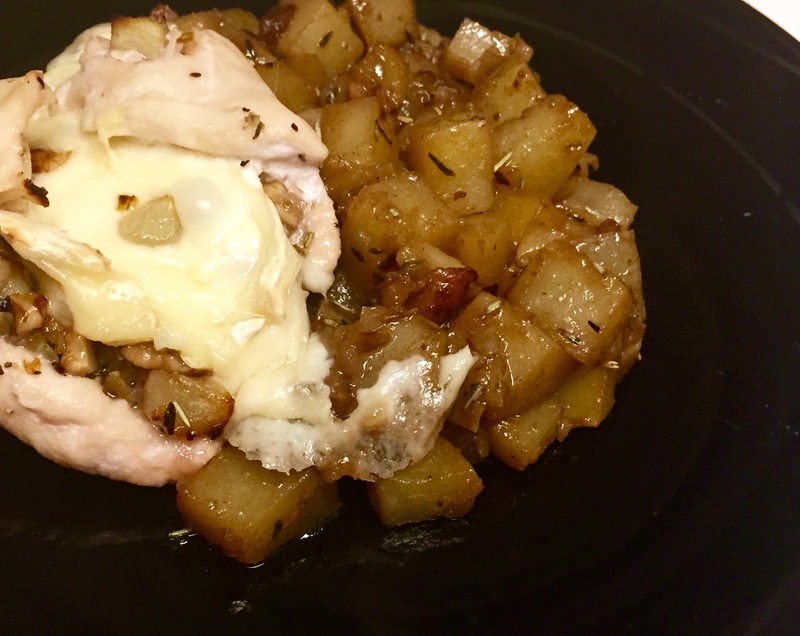 Feelin’ Fall: Apple- and Brie-Stuffed Chicken with Bacon and Apple Potato Hash – Pao Says, "Open Wide!" First, I preheated the oven to 450 degrees. I chopped up 2 thick cut slices of applewood smoked bacon and tossed them in the same pan I used to cook the apples and onions before. Once these pieces of bacon got crispy, I took them out of the pan and set them aside. I poured most of the excess grease from the pan (leaving a little behind) and added 2 Yukon gold potatoes and the other half of the apple, both diced into half-inch cubes. I let these cook up in a single layer for about 5 minutes and then I deglazed the pan with about 1/3 cup chicken stock , making sure to scrape off all of the flavor bits on the bottom of the pan. I sprinkled about 1/2 tsp salt and 1/2 tsp Rosemary , mixed everything up to combine, and then covered the pan and let it cook off for about 6-7 minutes until the potatoes were tender. I wouldn’t have thought to mix apples and potatoes, but I figured I’d give it a shot because of the excess of apples in my kitchen. I have to say, I didn’t regret it! Give this recipe a try and tweak it according to whatever your taste is!